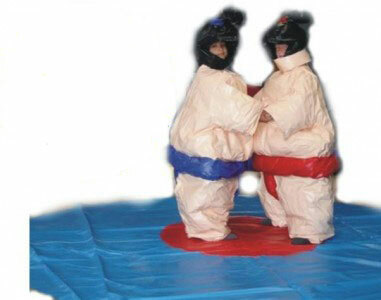 Kids Sumo Suits our great fun for all the kids in the family and at your party, barbecue, christening, wedding and any other event. 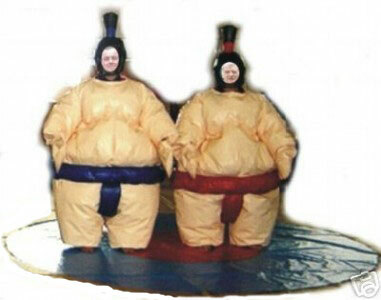 Adult Sumo Suits our great fun for all the big kids and adults in the family and your party, barbecue, christening, wedding and any other events that. Are you tired of wrestling your mates on the couch or bed, and want to try something new - something more professional? 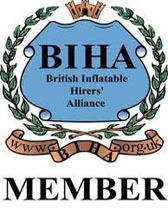 Then hire the Sumo Wrestling Suits in Liverpool. Each set comes with safety pads, mitts and neck braces for additional safety and to ensure everyone's enjoyment without breaking bones. This children's game is suitable for 5 to 11 years of age, and Adult Sumo Suits are for those 12 years of age and above. So if you are planning a dash of excitement in your leisure time or party, family event, barbecue, school or therapy session, try this Sumo Wrestling home and determine who's going to be the champion of all. Once you and your opponent are all geared up, go onto the cushion-like pad and start trying to throw your opponent out of the circle. Give it your all - pull, push, trip and splat as if you are a professional Japanese sumo wrestler. The first person who gains three points will be declared champion. Isn't it exciting to try knocking off your opponent with full force out of the circle? Of course it is! Who told you this is only for one-versus-one battles? If you have another set of sumo suits, you can ask your friends to have a big pile of wrestlers, all wrestling on one mat; the last man (or woman) standing will surely win respect, and can proudly say he is the champion of all. Fun, challenge, and thrill - Sumo Wrestling Home can provide all of these! If you want to turn your party into long-lasting memory that is worth cherishing, then call World Of Castles, Bouncy Castle Hire Liverpool, and place your order by answering our easy form. Once you are done, we will happily deliver the set according to your directions. Who knows, your party could be the talk of the town because of the fun, entertaining and exciting times you had with your family and friends.